Writing a resume objective is not easy but that does not mean it is completely hard to achieve. 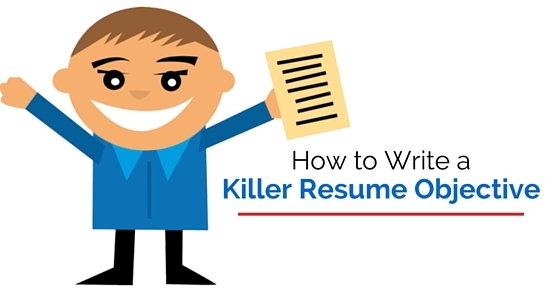 If you want to learn how to write a good resume, then this post would be perfect for you. Not only are we going to help you with writing a resume objective but will also give you ideas on how you should make it look more attractive and combine it with other good curriculum vitae or resume tips. So give this post a good read and we hope in that way you will be benefited greatly! Before we go to understand what needs to be done in order to write a good resume objective, let us first understand what it really is. A resume objective is something that displays why you want the job. An objective should describe in every job what you are hoping to do when you get the job and your aims. If you want to apply for the post of an assistant manager, that is what you should be writing down. Alongside write that you want to help the company improve with time and help them reach all important goals. Do notice that all the objectives mentioned in a resume are not more than words. There are some cases where we do add a few lists of resume words that we believe will help us add more definition to these objectives. The look of every resume objective that you put down in a resume should be very lean. There should be no extra words to add fluff to the matter. Neither is there any need to add words to show off how great your speaking skills are. Just mention in brief what the job seekers really want. The simpler you keep it, the better for you! 2. What should you call the objective? Now some people are often confused as to what they should be calling their job objective when they are writing down their resume. There are some who use the word career objective while the rest focuses on job objective. There are a few more who use the word objective only. There are other headings such as the goal of the career and goal of the job which is mentioned. Every objective in a resume is basically a summary of the achievements at work and accomplishments you have had so far. Here is your chance to mention the goal of your career and why the hiring manager should want to hire you. Now, this is really something that should be concise and must impress people. It also has some sort of effect on the read and must contain that comprehensive element we all are looking for. There are so many ways most of our objectives tend to replace the details that you might want to put under the category of the professional experience section. Instead of simply explaining what has been done in the past, you should always make a summary of the objective and write how you would like to use this experience in the future. Most job hunters often make the mistake and they do not even realize it. They tend to focus on the career objective and what they would like to do with their future and never place any regard to the company they are hoping to get a chance in. If you want an objective that is successful and well-tailored, you should know how to apply in a direct manner so that the hiring manager knows that you care about the company as well. Of course, there is a need for you to show how the experience that you have and the career goals that you want to reach will help the company in the future. There are a few job hunters who want the objective of the narrative to be mentioned in a list that is neat and goes in an order from a single point to the other. Lists will always allow a simple transition from mentioning the experiences you have had in the past to simply explaining how all these experiences will allow the company to improve. There are others who want the objective to be like a story. Whatever information that you write down should be based on some facts but presentations should always be interesting in the eyes of the hiring manager. Before you create an objective, it is highly important that you do some homework. Go online and look up some ways in which you can write objectives. We think that when you are writing down a resume for a company, you should be addressing the reader. Instead of simply writing down how you may help the company in order to succeed in a direct manner, always mention the name of the company and how you want them to become the best. You should also be sure to address all of the specifics regarding the position in which you are applying, then point out all the areas where you need some kind of professional experience and that would give you the whole idea. This is a huge mistake you could be making and we would definitely want you to avoid them. When you are writing a resume, do not ever make it look like it is all about you and what you are doing. You should also give some importance to the company. These guys are here to give you a job so make it look like it. You really don’t want to look like some ridiculous person who always blows things out of proportion. This is the second mistake we would suggest you to avoid. Please don’t write the same thing for all of them. You would be the one at a loss. Not them! Your goal should always be to become a candidate who is ideal and to ensure that you are what the hiring manager wants to find. If you make it a little more unique and interesting, you have a bigger chance of going all the way. Never be too vague. Like we have mentioned earlier, this is not about fitting into a size or doing something that would be just about okay. Our point is that your objective for resume should never in any way be vague. If you really want to do well, show some creativity. Try to show your unique side. And also please don’t mention words that are not necessary. Having too many grammatical errors is always a bad idea. You should have a perfect resume from top to bottom. If that is not the case, all your employers will choose to read between those lines and always draw a line that is not so flattering about conclusions. If you write your objective in a bad way, they will surely not be convinced that you can write well. It will really ruin your reputation. So when you are writing a resume and your job objective, make sure to mention all, check it at least twice before final submission. Another mistake we would ask you to avoid is to make things look too busy visually. If you add five different fonts, it is obviously not going to look very attractive. So make sure that you make it look appealing and nice. For this, you will have to use the simple font and most importantly the same font. Use capitals where it is needed while the rest should be off caps lock. The whole point is to make it look neat and clean, so make sure that it looks that way. There are times when we are so busy with our own piece of information that we almost forget to write a good objective. If you are feeling like you need some time alone in order to resume, then do take some time off. That would, in fact, be a good thing. Even though the resume is small, you should never leave out any important pieces of information. Just take care of this one point. Apart from that, you are good to go! It does not matter how good and well written your resume might be, it will not get passed through if the objective is not good enough so make sure to scan them accordingly before you send them. Plus they should not exceed more than two pages approx. You should write in a very logical resume format and use a couple of wide margins may be. It should be very clean and must come with headings that are clear. You should always apply the bold and italic typing face that will always guide the eyes of the reader. Also, remember to use bullets. That will grab more attention. Now, this is something you should always remember about resumes. Make sure it is never too long because your boss does not have all the time in the world to read what you have written. Your resume length should be appropriate. You should make it very straight forward and to the point. Don’t make the hiring manager regret reading your resume by making it three to four pages long. It is great to have work achievements and a list of awards but remembers that presentation always matters and you definitely are going to be judged on that. Also, you should remember to give a good resume summary of your career. Mention what is needed and what will help you land that job you have always wanted. You should be able to make a good impression within those first 25 seconds so make sure you are proving a point. You can spend some good amount of time into writing that summary that will change your life forever. Just describe yourself as powerfully as you can and also give a solution to the problems. Another point you should always remember that there should be no signs of errors on your job resume whatsoever. It should be spick and span and neatly done. Most importantly, it should display your creativity and how unique you are. When you present a resume, you are able to speak a lot about yourself. So make sure to remove all the errors and write something that will help you get the job you have always wanted. It all depends on the impression. So now you have it all! We have not just mentioned how you should be writing a resume objective but also told you what else you should be writing in your resume. Even though there are some people who think that resume objectives are outdated and are not needed anymore, we can say it is a must and would do well if it has been done properly. And we are hoping that through this post you have found some help. If there is some feedback you would like to give, please feel free to drop a comment right below. We would love to hear from you!